The most frequent cytogenetic abnormality detected in chronic lymphocytic leukemia (CLL) patients is the presence of a deletion within the chromosome band 13q14. Deletions can be heterogeneous in size, generally encompassing the DLEU1 and DLEU2 genes (minimal deleted region), but at times also including the RB1 gene. The latter, larger type of deletions are associated with worse prognosis. Genomic instability is a characteristic of most cancers and it has been observed in CLL patients mainly associated with telomere shortening. Cytogenetic and fluorescence in situ hybridization studies of a CLL patient showed a chromosomal translocation t(12;13)(q15;q14), a mono-allelic 13q14 deletion encompassing both the DLEU and RB1 genes, and genomic instability manifested as chromosomal breaks, telomeric associations, binucleated cells, nucleoplasmic bridges, and micronucleated cells. In conclusion, our CLL patient showed genomic instability in conjunction with a 13q14 deletion of approximately 2.6 megabase pair involving the DLEU and RB1 genes, as well as other genes with potential for producing genomic instability due to haploinsufficiency. Chronic lymphocytic leukemia (CLL) is a B-cell lymphoproliferative disorder commonly affecting elderly people . 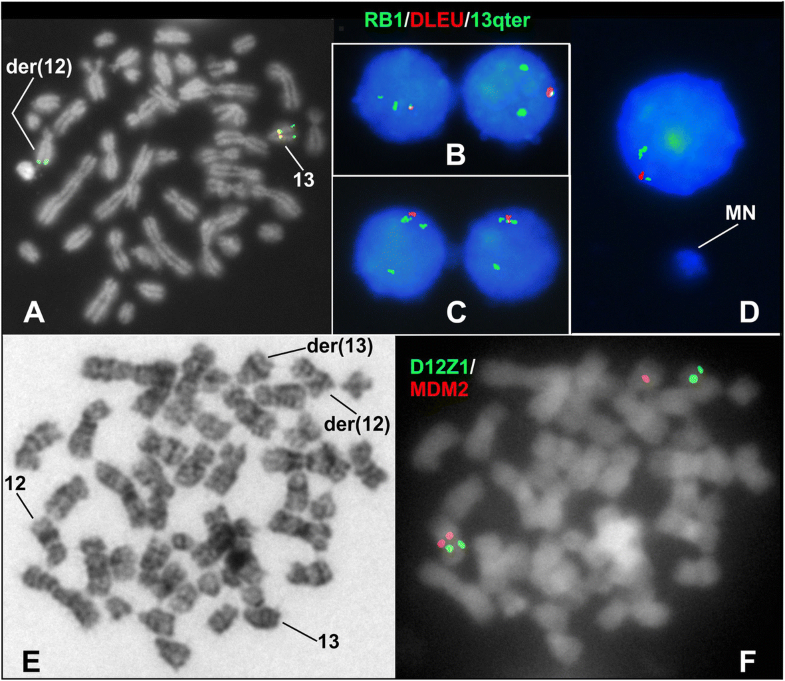 The most frequent cytogenetic abnormality detected by interphase fluorescence in situ hybridization (FISH) is the presence of a deletion within the chromosome band 13q14. Deletions can be heterogeneous in size, generally encompassing the DLEU1 and DLEU2 genes (minimal deleted region), but at times also including the RB1 gene. The latter, larger type of deletions are associated with worse prognosis [1–3]. Genomic instability is present in most cancers. It is characterized by a high frequency of mutations occurring within the cell genome. Alterations in several pathways involved in detecting and repairing DNA damage, telomere maintenance, and chromosomal mitotic segregation will cause increased frequencies of base pair mutation, microsatellite instability, telomere shortening, and chromosome instability mainly manifested as numerical and structural chromosomal abnormalities, micronuclei, and nucleoplasmic bridges (NPB) [4–8]. Several forms of genomic instability has been observed in CLL patients [9–14]. We here report a CLL patient with genomic instability and a large mono-allelic 13q14 deletion encompassing the DLEU1, DLEU2 and RB1 genes. A 61-year-old male patient with bilateral adenomegaly in the neck showed in his peripheral blood a leukocyte count of 49.1 X109/L, with 90% of lymphocytes. Immunophenotyped cells were positive for CD20, CD5, and CD23 surface antigens; therefore, after being diagnosed with CLL (Rai IV), the hematologist administered chemotherapy consisting of cyclophosphamide, adriamycin, vincristine, and prednisone, but the patient’s disease was refractory to such treatment. Next, the patient was started on fludarabicin and rituximab but an adverse reaction was later reported. Another cycle of treatment with cyclophosphamide and prednisone was administered with no response since leukocytosis remained during the 3 years that preceded his demise. Peripheral blood lymphocytes obtained before therapy were cultured in RPMI-1640 medium and stimulated with a mixture of phorbol-12-myristate-13-acetate plus pokeweed mitogen at concentrations previously described [15, 16]. After 72 h of incubation, metaphase cells were obtained from cell cultures harvested by standard methods. 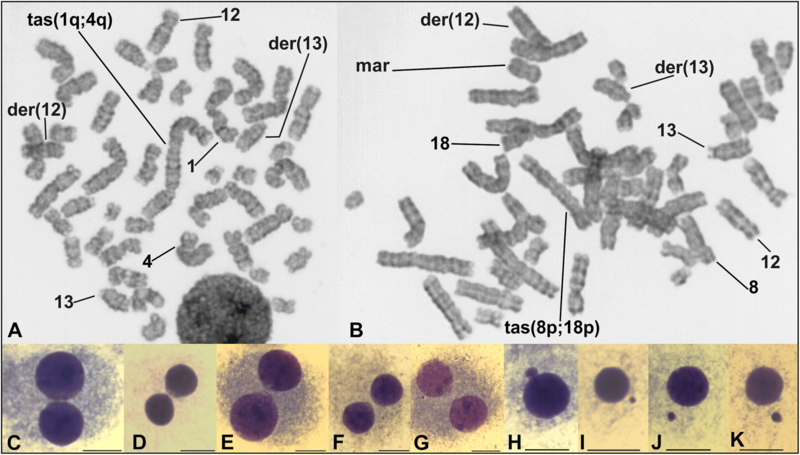 Chromosomes were stained following the Giemsa-trypsin banding protocol and analyzed under the microscope. Results were interpreted following the ISCN (2016) recommendations . Three fluorescent in situ hybridization (FISH) analyses were performed separately. In a first analysis, we used a mixture of the dual color 13q14.3-deletion probe (Cytocell, LPH 006), which covers the DLEU1 and DLEU2 genes (labeled in red) and the 13q subtelomere sequence (labeled in green), plus the RB1 (13q14) probe (labeled in green; Kreatech, KI-40001). According to information published by the providers, the red labeled probe targeted to the DLEU genes is conformed of two separated fragments of 215 and 93 kb, which together span a sequence from chr13:49962705 to 50,671,242 (hg38; ~ 700 kb). As for the RB1 (13q14) probe, it covers a continuous sequence approximately from chr13:48062708 to 48,801,516 (hg38; ~ 740 kb). A second FISH examination was performed using the MDM2 Amplification probe (Cytocell, LPS 016). We also performed a third FISH study with the dual color P53/ATM probe (Cytocell, LPH 052). In all these FISH studies, cells were counterstained with 4′,6-diamino-2-phenylindole. The Giemsa-trypsin banded metaphase analysis displayed the karyotype 46,XY,t(12;13)(q15;q14)/46,XY (Fig. 1 a and b). Seven out of these 25 cells carrying the translocation t(12;13) showed other single-cell abnormalities as chromosomal breaks, translocations, marker chromosomes, and telomeric associations (Fig. 1 a-b). In addition, while performing the chromosomal banding analysis we observed micronucleated and binucleated cells (Fig. 1 c-k). Micronuclei were observed in 68 out of the 1434 scored cells (4.7%), which is within the range of 2.23 to 4.8% of basal micronucleus frequency reported by Hamurcu et al. in six CLL patients . Moreover, thirty out of the 1434 scored cells (2.1%) were binucleated cells; and, eleven of them (0.77%) displayed NPB (Fig. 1 c-g), which is statistically different (p < 0.001; Fisher’s exact test) from the overall baseline NPB frequency reported by Cai et al. in the peripheral blood lymphocytes of 121 healthy individuals from the general population (0.46 ± 0.20 per 1000 binucleated cells) . The FISH study with the mixture of DLEU, 13q subtelomere, and RB1 probes aimed to reveal the status of the DLEU and RB1 genes in the derivative chromosomes of the translocation. We found a heterozygous 13q14 deletion of approximately 2.6 megabase pair (nearby from chr13:48062708 to 50,671,242, (hg38)), which included both the DLEU and RB1 genes (Fig. 2 a). Such a deletion was observed in 92% of the 200 scored nuclei. Strikingly, all binucleated cells, as well as cells having micronuclei, analyzed in this FISH experiment, were positive for that deletion (Fig. 2 b-d). Subsequent FISH analysis with the MDM2 probe was done in order to explore the location of the 12q breakpoint in the t(12;13) translocation; such a breakpoint was located centromeric to the MDM2 gene (Fig. 2 e-f). In addition, no evidence of trisomy for chromosome 12 was found after analyzing 200 interphase cells, which consistently showed two MDM2 and two D12Z1 probe signals. Furthermore, FISH study with the dual color P53/ATM probe for searching deletions of these genes disclosed normal results in the 200 scored nuclei (not shown). The translocation t(12;13)(q15;q14) observed in our patient caused a heterozygous deletion of the DLEU and RB1 genes. There are other translocations registered in the Mitelman Database of Chromosome Aberrations and Gene Fusions in Cancer  that affect the 13q14 chromosomal band. However, there are only four cases of translocation t(12;13) sharing the breakpoints observed in our case [20–23]. FISH analysis in two of these four cases showed 13q14 deletions of D13S319 or D13S25 markers, which are within sequence of the DLEU1 and DLEU2 genes [22, 23]. The 13q14.3 chromosomal band is the minimal deleted region for B-cell CLL and it is known for its potential tumor-suppressing function. It contains various tumor suppressor gene candidates, mainly the DLEU1 and DLEU2 genes whose loss has been considered as an early step in the development of the disease [24, 25]. It is hard to explain the genomic instability present in our patient since there are several mechanisms that could be related with its presence, as telomere shortening suggested by the presence of telomeric associations, as well as the gene content of the 13q14 region. There are several genes mapping in the deleted segment observed in our patient (chr13:48062708 to 50671242, hg38) whose haploinsufficiency has the potential for causing genome instability. The Mir-16 gene is involved in the DNA damage signaling pathway ; the RCBTB2 and SETDB2 genes play a role in chromosome condensation and segregation during mitosis [27, 28]; and, the KPNA3 gene is involved in the nuclear import of protein MeCP2 that has important roles in regulating chromatin structure . Regarding the RB1 gene, its protein plays a well-known role in G1 to S phase progression. Alteration of this mechanism of regulation causes a replicative stress, resulting in the production of DNA double-stranded breaks . Interestingly, new roles of the RB1 protein have been recently identified and all of them are directly involved in the maintenance of genome stability [31, 32]. Coschi et al. linked haploinsufficiency of the RB1 gene with a wide variety of aberrant processes affecting the normal cell cycle as alteration of the number of centrosomes, defects in the mitotic spindle assembly, occurrence of merotelic kinetochore attachments, and failure of cytokinesis generating either binucleated cells or NPB. Therefore, from this perspective, genomic instability could be a variable phenotypic consequence comparable to that occurring in contiguous gene syndromes, where deletions have variable phenotypic manifestations depending mainly on the amount of genetic material lost. On the other hand, telomeric associations observed in our patient could be true chromosomal translocations rendering dicentric chromosomes and could be interpreted as an indicator of telomere shortening, phenomenon that has been directly associated with genome instability in CLL [9–11]. It is well known that during cell division, dicentric chromosomes can be pulled apart towards opposite spindle poles causing an abortion of cytokinesis, which in turn, produces both binucleated cells and NPB [5, 31, 33] as was observed in our patient (Fig. 1 c-g). In conclusion, our CLL patient showed genomic instability in conjunction with a 13q14 deletion involving the DLEU and RB1 genes. Although studies of CLL patients include the determination of the 13q14 deletion, most of them focus almost exclusively on the DLEU genes. It would be advisable to determine the status of the RB1 gene in those patients with DLEU deletion in order to determine the size of the deletion and to make a better assessment of the prognosis. In addition, more attention should also be paid to the search for biomarkers of genomic instability in patients with CLL, as it could be a more frequent phenomenon than is currently reported. We thank María de Lourdes Carbajal her review of the writing. This work was funded by the “FIS -Instituto Mexicano del Seguro Social”: # FIS/IMSS/PROT/PRIO/16/061. The funding body did not participate either in the design of the study, collection, analysis, or interpretation of data, nor in the writing or reviewing of the manuscript. MPNR received a scholarship from Coordinación de Investigación en Salud, IMSS. México. The authors declare that all relevant data are included in the article. MPNR, MDDC, did laboratory work as karyotyping and FISH, acquired and interpreted data; LBAL and CBG contributed with the diagnosis, management and clinical-hematological follow-up of the patient; MTMT and JRGG interpreted data, designed the figures, and wrote de manuscript. All authors critically read the manuscript. All of them approved and agreed to publish the material contained in this manuscript. The authors declare to have complied with ethical standards. The data presented here are part of a research project approved by our institutional research and ethics committees (Instituto Mexicano del Seguro Social, Project # R-2013-785-071). Written informed consent was obtained from the patient for participating in this study. The patient gave his approval by signing an informed consent. Mitelman F, Johansson B, Mertens F, editors: Mitelman database of chromosome aberrations and gene fusions in Cancer (2018). https://cgap.nci.nih.gov/Chromosomes/Mitelman. Accessed 14 Jun 2018.